KOBOTA TRACTOR WIDTH 55" / MODEL B20 20 H.P. / MODEL B7500 21 H.P. TRACTOR'S TOTAL HEIGHT - 85"
KOBOTA TOTAL WEIGHT WITH LOADER 2050 LBS. MAXIMUM LIFTING HEIGHT - 86.3"
CLEARANCE WITH BUCKET DUMPED - 66.1"
MAXIMUM DUMP ANGLE - 40 DEG. BUCKET ROLL-BACK ANGLE - 40 DEG. 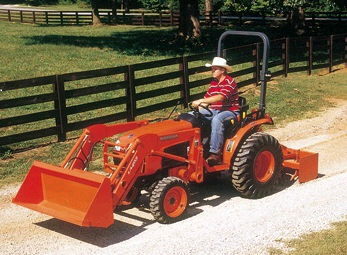 * Please call us for any questions on our tractor kubota 4 x 4 rentals in Corona, Norco & Inland Empire area.